How To Get Rid Of a Heat Boil Fast in a Natural Way? Summer season is to enjoy cold drinks and wear summer dresses. 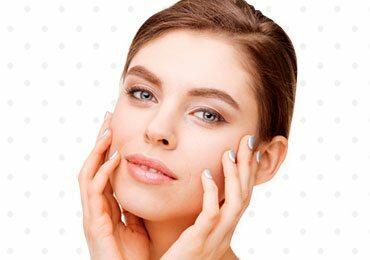 Unfortunately, summer affects the skin, which is considered to be the most sensitive for any person. Excessive heat and sweat can result in several skin infections. One of the major skin infection caused in summer season is Heat Boil. But do you know how to get rid of a heat boil fast? Heat boils are puss filled nodules which if not attended early can form painful infection in the affected area. Heat boils usually start as a small red nodule which can be in any part of the body. Slowly the small red nodule becomes considerably large and causes excessive pain in the area. Some people think pimples and heat boils are the same things. However, there is a considerable difference between them. 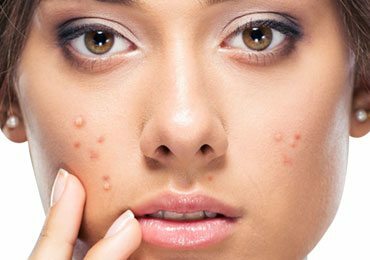 Pimples are mostly single eruptions whereas heat boils appear in clusters. The nearby areas in case of heat boils are hard to touch and are very painful. The primary reason behind heat boils in summer is the excessive heat and temperature fluctuation. This helps bacteria to thrive in the body which soon results in the formation of nodules. The other causes of heat boil attributes to poor hygiene, improper sanitation, friction with the clothes etc. How To Get Rid Of a Heat Boil Fast? Our kitchen is not only for keeping our tummy full instead it has the number of useful resources which can be considered as a first aid for some disease or infection. 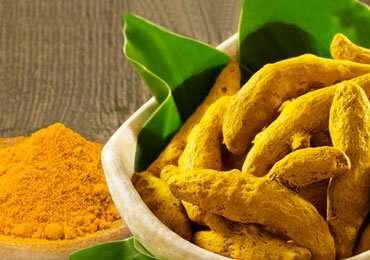 Turmeric is one of such kind. Every Indian kitchen has this spice and is useful for curing heat boils. 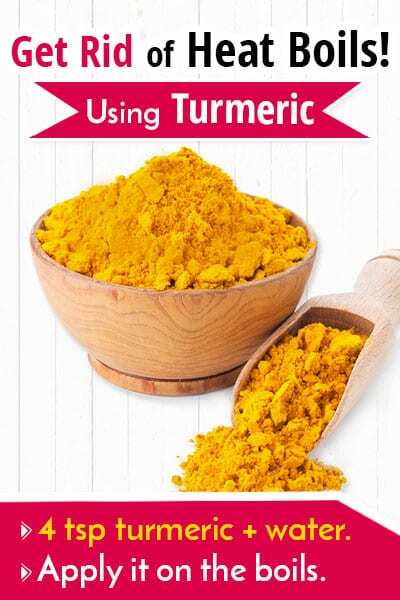 Take about 4 teaspoons of turmeric powder and make a paste with plain water. Apply it on the boil at a regular interval of 4-5 hours. This will kill the bacteria causing the boil and provide relief instantly. 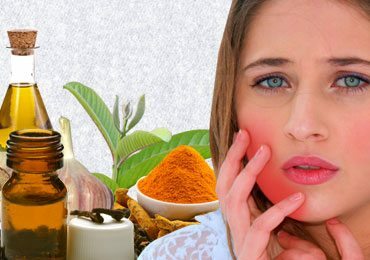 Turmeric absorbs the pain and is very effective to heal the heat boils. 2. How To Get Rid Of a Heat Boil Fast Using Cumin? 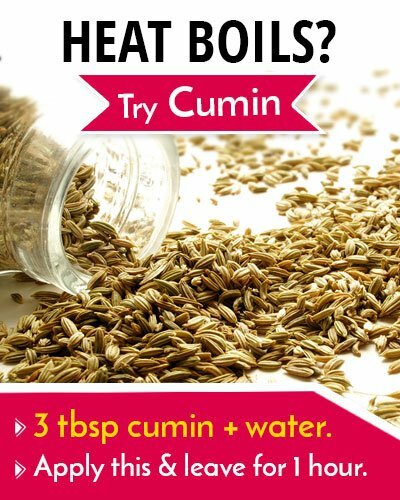 Cumin can also be very useful in getting rid of heat boils. Cumin has anti-inflammatory properties which will reduce the size of the nodules and eventually dry up. Take about 3 teaspoons of cumin seeds. Use a mortar and pestle to make a smooth paste of these cumin seeds by adding sufficient quantity of water. 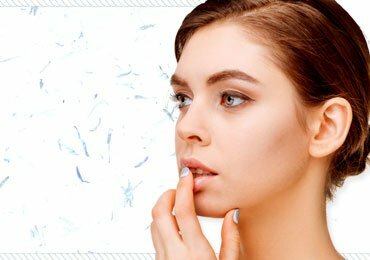 Apply this paste on the skin and leave it for an hour. Wipe it using a clean cloth. Follow this process at a regular interval of 3-4 hrs. This will help in the fast recovery of the boils. Garlic is well known for its anti-bacterial property and acts like an antiseptic on the heat boils. Take 2-3 garlic cloves and crush it thoroughly to form a paste. Apply the garlic paste on the affected area to seal the nodule completely. Leave it overnight and wipe with a clean cloth the next morning. Consume 2-3 crushed raw garlic cloves followed by a glass of water. 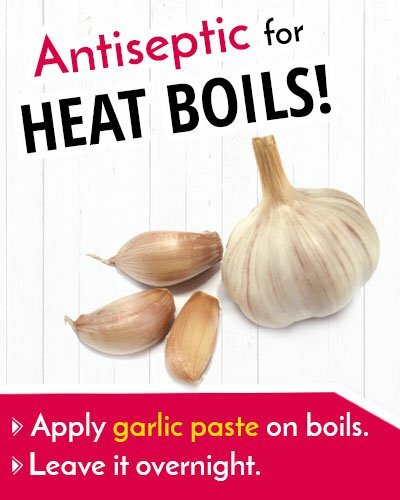 Also, add garlic to your regular food to get rid of heat boils within few days. 4. How To Get Rid Of a Heat Boil Fast Using Onion? Onion has both antiseptic and healing properties. Take one onion and blend it in a blender. Extract the fresh onion juice in it. 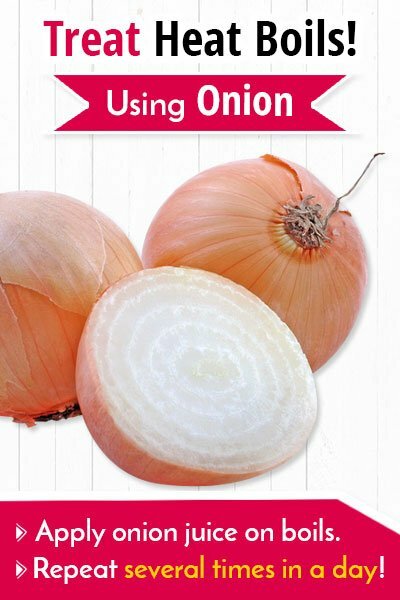 Soak a cotton ball in this onion juice and apply the onion juice over the affected area. Repeat this process several times in a day for the boil to dry up completely. 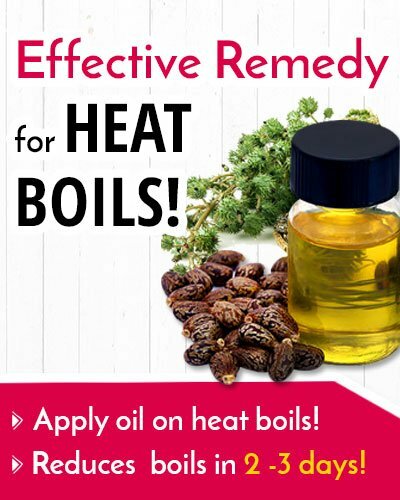 It is considered as a miracle remedy for boils. Take a cotton ball and pour 6-7 drops of castor oil. Apply the oil on the heat boils and seal the boil by using a bandage or by tying a clean cloth over the cotton ball. This will prevent the leakage of the oil. This method helps in reducing the boils within 2 -3 days as the pus comes out and the boil will weaken. Use this method regularly several times in a day to get rid of the boils. 6. 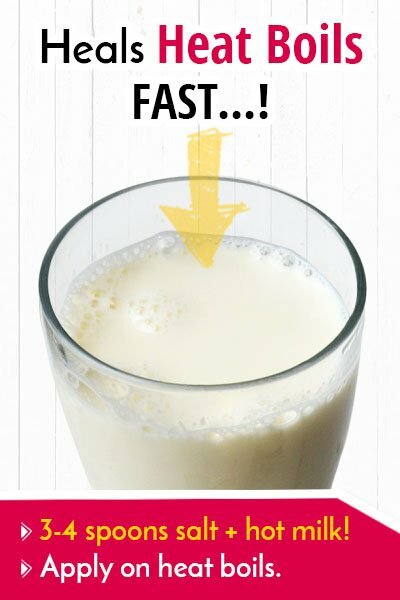 Milk – How To Heal a Heat Boil Fast? Milk is a known age old method to heal heat boils. It works well on the boils and cures them rapidly. There are two ways of using milk. Boil milk in a container and take half cup of hot milk. Add 3-4 spoons of salt in the hot milk and stir well. Add flour to the milk to increase its consistency so that you get thin paste. Apply the paste on the heat boil and leave it for some time. Repeat this process several times in a day, gradually the boil will break and pus comes out. Add few drops of vinegar and 1 tablespoon of turmeric to warm milk. Mix well to make a smooth paste. Use this method 2-3 times in a day for faster healing of the boils. 7. 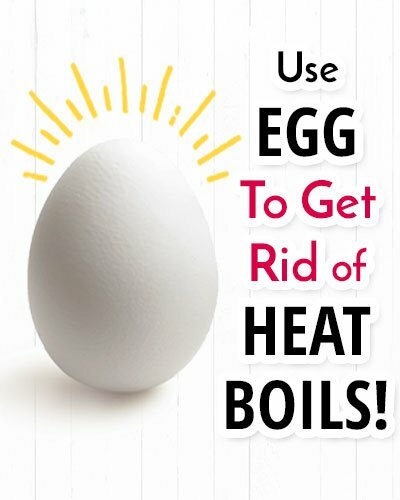 Egg – How To Get Rid Of a Heat Boil Fast? Eggs are equally useful on the boils and provide immediate relief from pain. They also help to get rid of the boils within 2-3 days. Take one egg and boil it in a container. Allow it cool down and peel the outer skin of the egg. Cut the egg and soak the white portion of the egg in water. Apply the soaked egg white on the boils. Seal it using a clean cloth. Eggs generate heat which helps the boils to break and within 2-3 days it gets cured completely. Corn powder is also good to heal the boils faster. 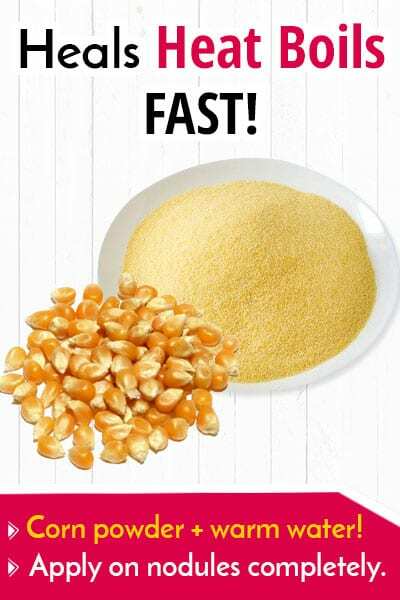 Take 2 tablespoon of corn powder and add sufficient quantity of warm water to make a thick paste. Apply this paste on the boils covering the nodules completely. Leave it overnight and wipe it with a wet cloth next morning. Repeat this method for few days to get rid of the boils. 9. How To Get Rid Of a Heat Boil Fast Using Indian Lilac? Indian Lilac or Neem leaves are known in Ayurveda for its anti-microbial and antiseptic properties. It helps to cure the boils and reduces pain considerably. Neem leaves can be used as a paste as well as an antiseptic solution. Take a handful of fresh Neem leaves and grind it to make a thick paste. Apply the paste on the affected area and the nearby region. Leave it for an hour or so and then wipe it with a clean cloth. Boil water in a container and add fresh Neem leaves to it. Allow the leaves to boil for sometime till the colour of the leaves starts fading. Strain the solution and use the same as an antiseptic liquid to rinse the affected area. 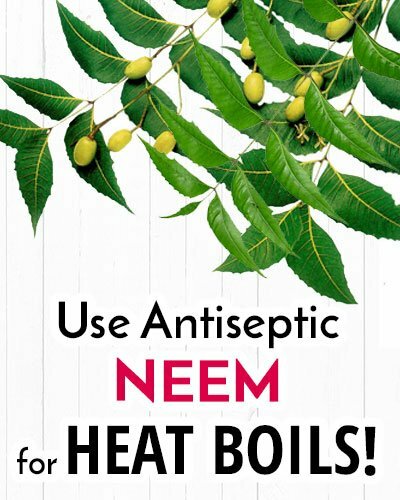 Neem leaves act faster on the boils and the boil will dry up completely. This is one of the effective methods to get rid of heat boils. Go for Neem Oil Uses And Its Amazing Benefits that you never heard before! 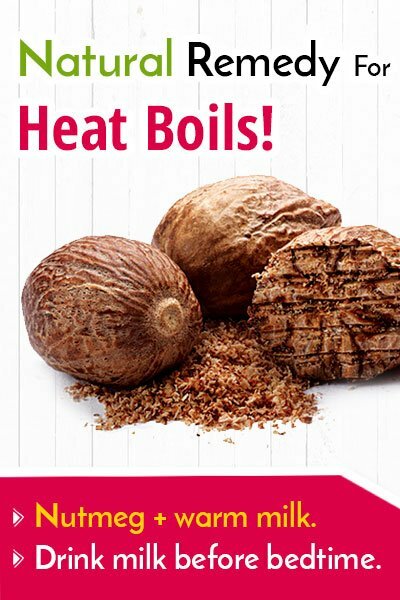 Nutmeg, more popularly known as Jaiphal is very effective to cure the heat boils. It is known to increase the blood circulation in the body which helps to gradually get rid of the boils. Add a pinch of nutmeg powder to a cup of warm milk. Drink the milk once before going to bed. Repeat this method for a week to see considerable difference in the heat boils. 11. How To Get Rid Of a Heat Boil Fast Using Bread? Bread poultice is very useful for heat boils and the boils will disappear gradually in a natural way. 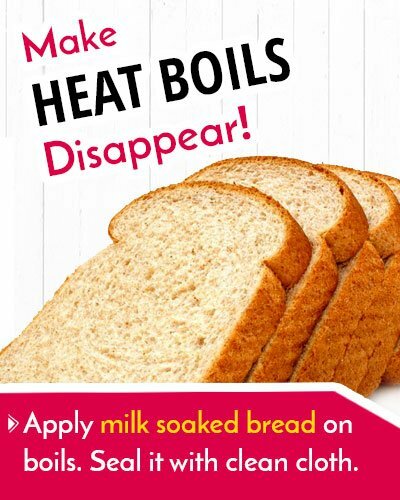 Soak a piece of bread in warm milk and immediately apply it on the heat boils. Seal the surface using a bandage or a clean cloth. Allow the boils to absorb the warmth of the poultice. Follow this process 2 times in a day and within few days the heat boils will disappear completely. Avoid touching the heat boils frequently as it will help to spread the bacteria. Wash your hands thoroughly with a disinfectant before and after touching the boil as it will prevent infecting the nearby areas. Drink lot of water and fresh juices to increase the blood circulation in the body. Refrain going outside too much in summer as sweat and dirt are the primary reason behind heat boils. Avoid consuming oily and sugary substance as it may aggravate the condition. Keep your towels and handkerchief clean and use an antibacterial soap for the skin. Caffeine can be extremely dangerous when you are having heat boils. Therefore, avoid consuming coffee and other beverages which has caffeine as content. Maintain good hygiene and exfoliate your body 2-3 times in a week to prevent clogged pores. Heat boil is a painful condition and may aggravate if not attended immediately. Sometimes the nodules can cause severe pain, therefore avoid touching the nodules frequently. 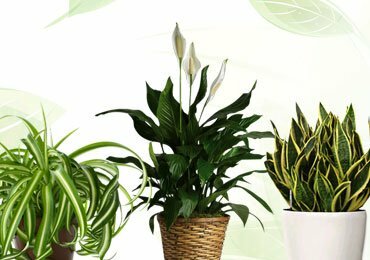 The above-mentioned home remedies provide respite not only from the pain but they help to eliminate the heat boils completely. However, if you do not see any difference in the heat boils even after trying the remedies for some days it is better to consult a doctor and take medicines accordingly. Prevention is always better than cure; therefore take precautions this summer not to suffer from this condition. The severe pain may at times lead to fever in the body, hence maintain hygiene and stay away from heat boils. 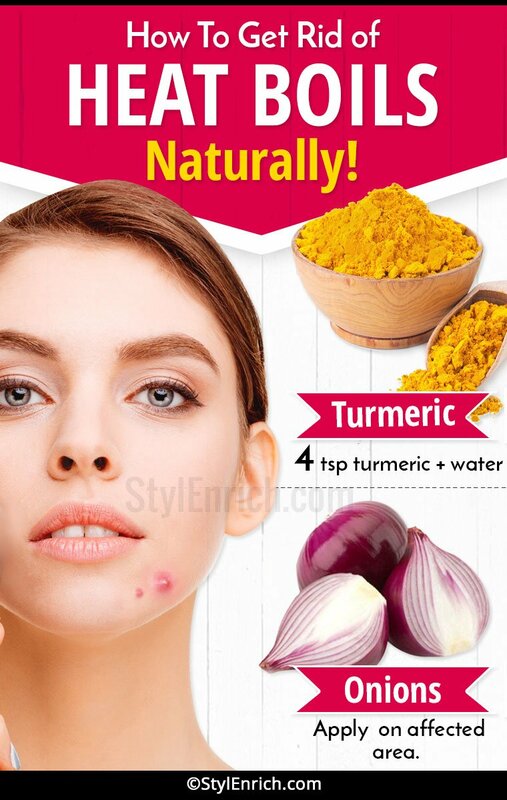 9 Turmeric Benefits That You Must Know! 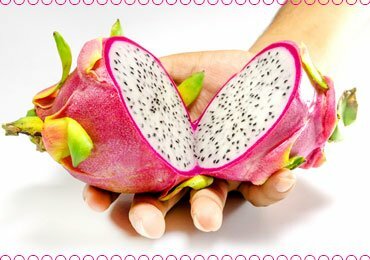 9 Incredible Dragon Fruit Benefits!